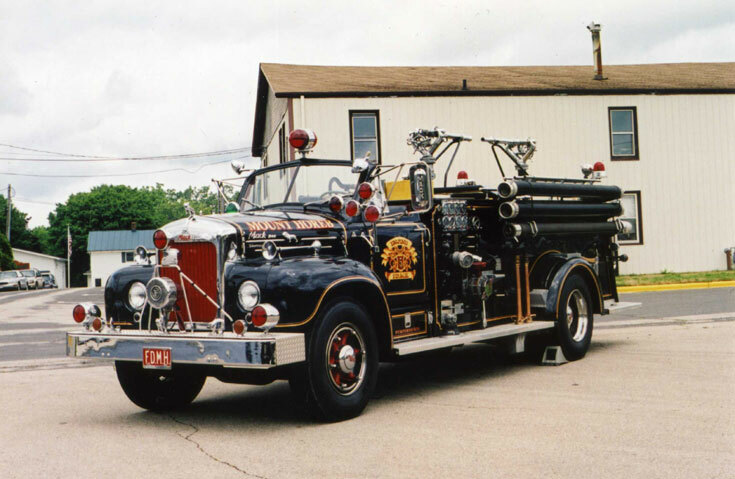 A 1956 Mack from the Volunteer Fire Department Mount Horeb. Any idea what the light above the windshield is - something they have knocked up or an off-the-shelf? Added by Pav on 20 June 2012. The light above the windshield was made by MARS and had an occilating reflector for both the front and rear of the light unit. It was a common type of warning light used in the Chicago area and surrounding mid west states areas. Added by John Harris on 20 June 2012. Back to the current photo. I'm wondering if this lovely Mack B-model was fitted out with all those lights in service, or got them later when it was used as a parade piece. It's got an incredible Christmas tree of lights -- the double one on the windshield, a Roto-Ray, two newer Mars lights on the bumper and one older one above the Fed-Q siren, little rotating beacons on the rear. Wow! Added by Mike Feldman on 21 June 2012. By the way -- Mount Horeb is in Wisconsin. Check out their department site at www.fdmh.org. Roto-ray light on the right. Added by Andy Middleton on 21 June 2012. The green light on the right side is also a Midwest tradition. The Chief of the Chicago FD in the 1920s, was a former US Navy Commodore, and he thought his trucks would be more easily identifiable if - like US Navy craft - they had a starboard green light to match up with the red one on the port side. All CFD and many other Midwestern departments still have these, although for some reason they are not to be found on the CFD ambulances. CFD also fit a clear oscillating center light on the front panel, for better daytime identification in bright sunlight. All the research shows that a clear light is seen first in daytime, which might be a topic for those in Europe who are concerned that the blue light is not adequate in bright sunlight. By the way, the blue light for emergency vehicles was invented by the German Nazi government, which is kind of an odd bit of history. Added by Rob Johnson on 21 June 2012. I think those are Federal Propello Ray or Federal Solar Ray lights on the bumper.The base has a different look than a Mars 888 light. Added by Les Davis on 22 June 2012.